Wow! What heck has been happening to the Aussie?! It just dropped 700 pips this past week! Looks like I was too conservative on my trade! After that major sell-off early last Wednesday, I thought I could get in on a potential retracement. Little did I know that we were going to see a major Aussie sell-off! The Aussie just kept on falling and falling and falling and falling! In any case, I’ll be waiting for another opportunity to short the AUDUSD if the pair retraces a bit. Hmmm, perhaps a retest of the former broken neckline of the triple top? Now that I’m taking a bearish stance on the Aussie, the only thing is to find a nice entry on the pair. 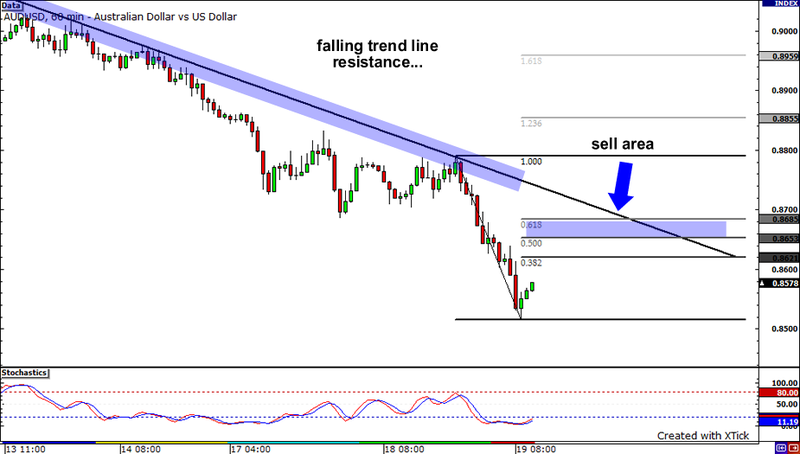 I took a look at the 1-hour chart of the AUDUSD, and it looks like price has been respecting a falling trend line. Time to jump in on a retracement? I popped on the Fibonacci tool and what do I see? The 61.8 Fib level lines up nicely with a former support level, as well as the falling trend line. I’m looking to short at 0.8685, with my first take profit points at the recent low at 0.8520. I’m setting my ultimate take profit at 0.8250, a former area of interest. My stop loss will be at 0.8800, which is way above the falling trend line and former highs. Fundamentally, traders have been pushing the Aussie down under ever since RBA Governor Glenn Stevens remarked that interest rates are already moving towards their normal levels. In their recent monetary policy meeting, policymakers also assumed the same dovish stance, hinting that they could hit the pause button on their rate hikes. This bearish outlook, along with the recent bout of risk aversion spurred by debt contagion fears, could push the Aussie even lower. It seems that these woes are also taking their toll on Australia’s consumer sector. Just a few hours ago, Australia released the results of the Westpac consumer sentiment survey, which revealed that consumer sentiment turned sour in May. After witnessing a 1.0% decline last April, the reading posted a much larger decline of 7.0% this month. Speaking of recipes, I’ve come up with a new concoction – a double fudge, chocolate chip, almond, oatmeal cookie, with sprinkles and marshmallows to boot. A little bit too sweet for your tastes? Not for me!